Samsung’s Gear 360 camera for creating virtual reality content will go on sale online on Friday, the company announced Wednesday. The Gear 360 will initially be available only in South Korea and Singapore, a company representative said. A U.S. shipping date still hasn't been announced. In Korea, it will cost 399,000 won (US$347). The camera, a bit larger than a golf ball, is Samsung’s bid to get consumers involved in creating virtual-reality content instead of just consuming it. “We think 2016 is shaping up to be the year of VR,” said Andrew Dickerson, director of software engineering for Samsung VR, in a keynote presentation at the Samsung Developer Conference in San Francisco. The camera will have two 180-degree fisheye lenses back to back and will stitch together the video from each for a 360-degree view. With a total of 30 megapixels of resolution, it will provide 4K video quality. Samsung’s Galaxy S7 and S7 Edge smartphones will link directly to the Gear 360 to act as live viewfinders. VR is a key part of Samsung’s combined hardware, software and services strategy. The Gear 360 will join the Gear VR viewer and the recently announced Milk VR service for authoring and sharing content as part of the company’s plan to expand in this area. In the next few years, Samsung expects to deliver a “holodeck” experience, said Injong Rhee, executive vice president and head of R&D for software and services. He was referring to the virtual environment used on the TV series "Star Trek: The Next Generation." That experience will be truly immersive and allow users to roam around a physical space. It will make use of capabilities like gesture tracking to allow users to feel they are touching virtual objects, he said. 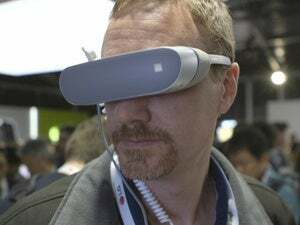 To do this, the company is working to overcome problems including poor image quality, insufficient computing power, the heavy weight and restricted mobility of VR headsets, and the dizziness some users experience, Rhee said.